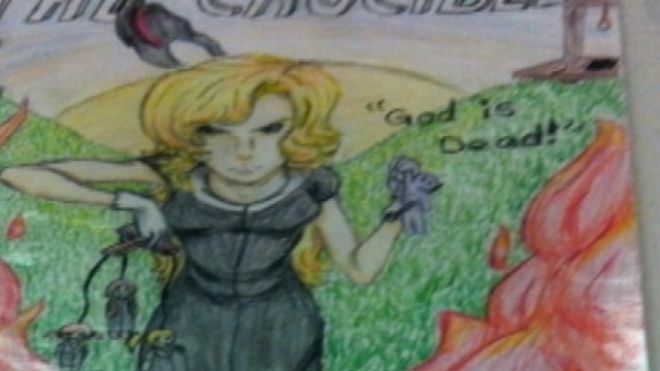 COVINGTON, Ga. — A student-crafted poster based on a play about the Salem witch trials of the 1600’s has sparked controversy in a Georgia community. The poster features a line from the 1953 play “The Crucible” by Arthur Miller, which declares, “God is dead!” It hangs on display in a classroom at Alcovy High School in Covington, Georgia along with other student drawings. Although parents have expressed disapproval of the artwork, which reportedly is the result of a student assignment after reading the script, district officials state that the poster is rather a reflection of the drama as opposed to a statement about religion. Therefore, the district says that the poster will remain, and in an effort to assuage concern, students will be briefed about the context behind the “God is dead!” declaration. However, some parents believe that the artwork should still be taken down due to its offensive nature. One of the most outspoken opponents of the drawing is parent Crystal Mitchell. “If my child can’t pray in school and they’ve taken religion out of school, for this to be plastered on the walls of school, is a huge concern for me,” she told reporters. She said that her daughter, who attends Alcovy High School, is uncomfortable with the poster. Therefore, to combat the matter, Mitchell created a Facebook page entitled God is Alive in Newton. In just one week, the page has received over 800 likes. “Due to some artwork that was brought to our attention that is hung on walls of a Newton County high school stating ‘God is dead’ and ‘The Devil is alive,’ we feel it is important to display ‘art’ proclaiming ‘God is alive’ in Newton,” she wrote, citing Hebrews 4:12. According to Mitchell, a number of parents have contacted her suggesting that they join together in a unified effort to express their concerns to the school as a group. Mitchell has met with officials privately thus far and has been urging others to contact to the school to express outrage. The name of the student who drew the poster has not been released.